A couple of previews of the next chapter: a steam engine used in the mines of Durga Seung, and a new incentive page. 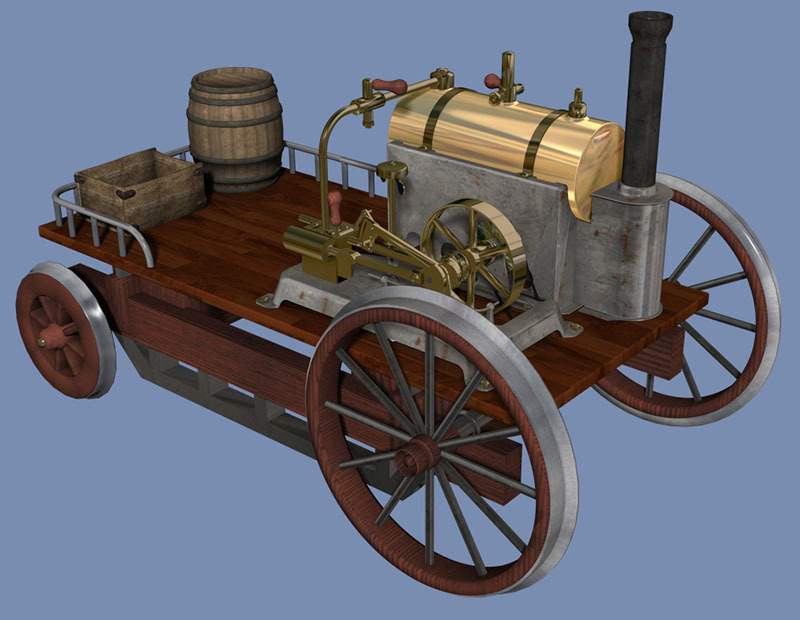 I loosely based the steam engine model on the Stevens' Rack Rail Engine of 1825. I'll post the next page on Monday, and another page on Thursday of this week. I did a little more texture work and added a few details. Still not done but getting there. Also changing the hubs to metal. Looks good. Especially on a world like this, it makes sense that early steam engines would first be used in mines. However, I do recommend that you re-texture some of it. That engine looks brand spanking new - better than new, even. It practically glows it's so shiny, as if it was plated in chrome and gold. Being used in a mine and being one of their first steam engines, it should be made steel, or perhaps tarnished brass. It would not stay shiny very long. And the parts of it that do not get too hot, like the base, might be painted to prevent rust. Even the rails on the tracks should be a darker shade of gray. I've never seen tracks that shiny and light, except for the very top where the steel wheels constantly wear down the rail surface. Perhaps even back in the early days of steam engines they used Steam Treatment (Google it)? This gives steal a dark gray or black-ish tint that protects from corrosion. Good points on the aging. In addition to tarnish and natural patinas, if its used in a mine, remember that it's a rough environment. There would be a number of dents, pock marks, and bent pieces reflecting that. To expound on the parts that get hot, there would be various degrees of blackening, etc. The tracks themselves would also bear some of this; they'd be kind of rusty except for the top surfaces, which would be shiny and smooth, with maybe a few dings and abrasions. The wheels, and their flanges on the engine and tender would be a shiny burnished surfaces where they meet the track, but otherwise appear more like the rest of the various parts. Very good model overall though. Thanks, and I agree on all of that. I haven't started the UVW unwrap for texturing yet. That's where the 3d model gets ironed flat to accept a 2d texture. I have about a month before we see the engine in the story so I have some time yet. I'm probably going to make a few more changes before then, maybe add some rails and detail stuff. I notice that the first vehicle after the engine is a mine car. If so, then on your engine platform, you might show some sort of fuel (wood/coal) bin in the operator/engineer's area. (Probably adjacent to the boiler) Otherwise a tender might be the vehicle directly following the engine. It's probably not a long distance runner, so a bin on the engine platform might be adequate. At the front set of the wheels is the railhold on left side. It will derail instantly to left! Left wheel need the railhold on the inner side, not the outer. That wheel needs to be turned 180 drg. on vertical axis. It's right, just not placed in the scene to well and it's clipping the rail a bit. It was just supposed to be a quick preview. This is a marked improvement. I do like the barrel and box in the back. The wood is much more natural. (But the red wood on top seems a bit too red.) And the rail in back is a nice touch. Though... Shouldn't there be a noticeable lever to switch the machine between forward and reverse? I like how the steel around the broiler looks naturally worn and slightly corroded. And I like the black metal look of the smoke stack. You may want to use the same (or a similar) black metal texture for the rails. Personally, I'd also use that black metal texture (or similar) for the frame underneath the steam piston engine. As it is, it may be worn and slightly corroded-looking, like under the boiler, but it's still far too light to be appropriate. I'm saying this as someone who has seen steam engines firsthand (relatives who've owned them) and who has attended a local steam engine show. The type of locomotive here is just the type one might expect to see in this type of duty. The engine itself would be smaller and operate at a higher RPM, (It even includes a flyweight governor!) and be geared to provide high torque to the drive wheels, rather than the direct crankpin connection found on cross country trains. Yes this is a leap forward in appearance! A couple things stick out a little; maybe some variations in metals in the engine proper, and kind of beat it up a little as well. Right, it's direct drive and there's no fwd/rev gearing. Unlike a combustion engine that can only run in one direction, steam engines can run both ways. Which reminds me that I need to add coupling on both ends, not just the back.